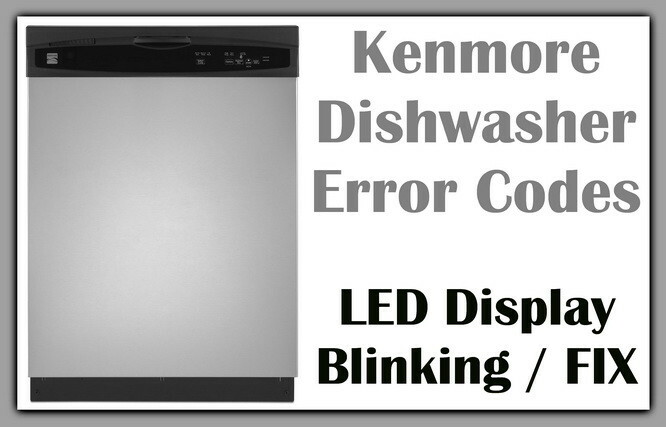 Kenmore dishwasher displaying an error code, flashing LED light or blinking LED lights? Kenmore dishwashers have built in diagnostic systems. If your dishwasher finds, sees, or detects a fault or error in the system, it will show an error, the LED lights will flash, blink, or a fault code will be displayed. The error code or LED lights will display on the panel. When an error code or LED light is blinking, your dishwasher is telling you a specific fault. The error code or the LED light sequence will tell you which parts on your Kenmore dishwasher to replace or check. You can also Search YouTube for Kenmore Dishwasher Flashing Blinking Lights or get advice from your Kenmore dishwasher owners manual when your Kenmore Dishwasher Is Displaying An Error Code or flashing the LED lights. Do you have an error code or LED light sequence indicating a problem with your Kenmore dishwasher? 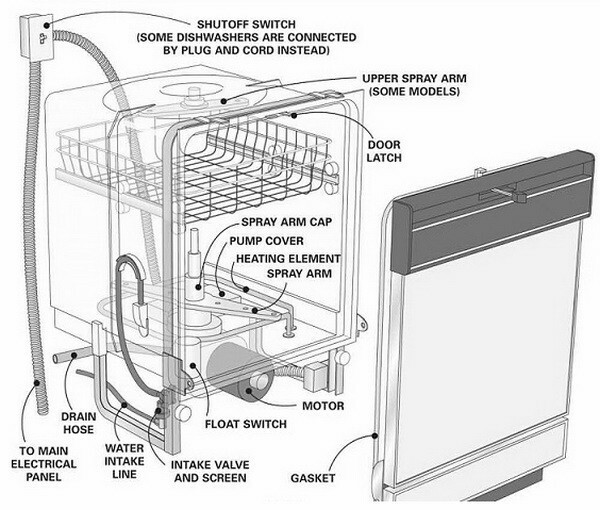 Please leave your question below and we can help assist to troubleshoot your dishwasher issue. Kenmore Elite has error code F4E1 – call for service. What is really going on, can I fix myself, or is there something that I really need someone else for? I have a Kenmore 13473 dishwasher, I can’t find my manual so my question is why is the red light on the heated dry button during my normal wash cycle? Is something wrong with my heating element? It is not a flashing red light it is a solid red light. I’ve got a Kenmore Elite Dishwasher, model 665.1277 that won’t start (4-5 years old). After selecting any cycle and hitting start, almost immediately the start and washing lights simply blink. I’ve previously run through the test cycle but now when I try to do that all of the lights come on the control panel and it never starts the test cycle. Loaded. Closed, Press Start button. Normal Cycle on, Heated Dry on, Nothing happens. Press Start Button again, Start Button led lit, Blue Washing led on, Nothing happens. Press Cancel Drain: All lights go off except Red led lit. Press Cancel/Drain again, all lites off, including red led off. I have Kenmore Elite dishwasher model 665.12772K311. Ran diagnostic test which took 14 minutes. It left me with 2 lights “1 hour wash” & “quick rinse”, not blinking just dimly lit. What is this telling me? Don’t know how to proceed. I have a Kenmore Elite with a continually flashing red Normal Wash button. Have been unable to reset anything. My Clean button was flashing. Not sure WHAT the issue was, the troubleshooting guide says “malfunction-get service” I did the reset but wonder IF it is a malfunction signal, will just resetting be the fix? Or when it doesn’t run, I go from there. THANKS, you really help people. Model 665.1372, 73, 82, 83 or 1322. I have a model 66517772990 dishwasher. Its approximately 1 million years old or there about. Anyway the water heat light started to flash when the dishwasher is not in use. I downloaded the english version of the manual but it did not offer any tips about flashing lights. Please advise. I have the same model. Starts washing then stops after about 10-15 minutes and just starts blinking. Sears repairman came out and said to replace the main computer board. We ordered it on our own, replaced it but that didn’t help. A second repairman came out, confirmed it wasn’t the main computer board and told us to replace the top board (that has all the buttons across the top). We ordered and replaced it. That didn’t work. Now Sears wants to send out a 3rd genius. She did say that if he can’t fix it I will be reimbursed for his fee. Not the first two. Thanks for sharing… I have the EXACT same problem with my Kenmore Elite 665.127. After diagnostic, I’m getting COMPLETE blinking 6x then 4x and over and over and it goes to black. And I can’t figure what that means. About to try the power down- reset strategy. Your experience was not hopeful. How did it end? The first thing to try is to totally power down your dishwasher. This is generally done at the circuit breaker panel. Allow the machine to be powered down for at least an hour. This should clear the mother board (brain) of the computer of any faults. Options: Turbo zone, Hi temp wash. sani rinse, smart dry. 587.15413100A Kenmore Dishwasher with “Er” message flashing. Machine fails to complete full cycle. Lights illuminated on “Quick Rinse”, as well as the three items under “Er”, “washing, clean, sanitized”, -and the lock symbol. I have a Kenmore elite 465 dishwasher that has the first red light flashing and the start resume flashing. Cancel doesn’t work. Is there a reset function I could try? Try Pressing and holding the Start/Resume button for 10 seconds. If that does not work, try the reset code: Press Heated Dry, Normal, Heated Dry, Normal and it SHOULD reset your Kenmore Dishwasher. There is no “heated dry” on my display. It says sensor dry or some such thing and that doesn’t work. I will try the hold on the start -. My friend has a Kenmore Ultrawash Quiet Guard 4 dishwasher. About a year ago the clean light was flashing 7 times. I did the reset normal wash, heated dry a couple of times and it worked great up until a couple of weeks ago when my friend said there was a burning smell coming from the dishwasher. I tried the reset again, but the machine will only do a short cycle, about 20 minutes and the clean light starts flashing again and the dishes are not clean or dried properly. It is model # 665-17033402, serial # F83903682. I have not been able to find a fix specific to this machine. I suspect it is the heating element, but I tried the door and I can pull open the door without much force without releasing the latch. Any help would be greatly appreciated. Thank you. Heated Dry, Normal, Heated Dry, Normal. Let the unit run for 2-3 minutes and then you press the Cancel/Drain button and allow it to completely drain and reset. The dishwasher will run and operate normally unless it does not detect a water temperature rise again. Thank you for your comments and advice. I will check what you have recommended and try it again. Will keep my fingers crossed and hope that it works. We were forced to call a tech to have a look. It turns out it was the control board which burnt and has to be replaced. I was really trying to avoid calling anyone but having checked everything and coming up empty we decided to call the experts. Thank you for your help and support, Much appreciated. I have a Kenmore ultra wash quiet guard dishwasher which is unresponsive to all buttons except the cancel and delay buttons. I have replaced the control board and am ready to replace the function board. Is there a trick to remove this from the molded assembly without damaging it? It should pop off with a flat head screwdriver by lifting where the cover snaps into. Did you replace the control board because of the unresponsive buttons? Have you tested the boards to be sure it is not just a simple fuse or wire harness? It was recommended to change the control panel if the board still had some functions. I have one on order. The only function buttons working were the cancel and time delay. Thanks for your reply though. The advise we gave was to try and fix the issue without having to spend mountains of money. We use the troubleshooting methods that are MOST LIKELY THE PINPOINT CAUSE and work backwards and forwards from that point. The control panel is not cheap but if you purchase it online and install it yourself it will save you hundreds of dollars. Or, buy the part and just hire the repairman to install it. It is an easy job. Previous post: How To Light A Candle If The Wick Is Too Far Down In The Glass Jar? Next post: New Dimmer Switch Has Aluminum Ground – Can I Attach To Copper Ground?